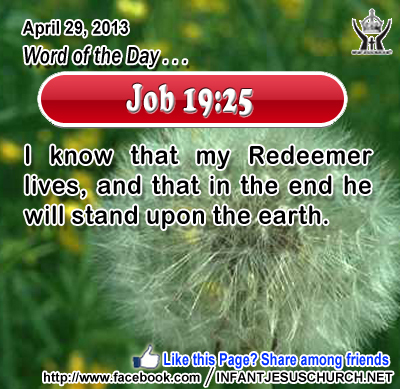 Job 19:25: I know that my Redeemer lives, and that in the end he will stand upon the earth. Heavenly Father, Conquering King, Immortal God, we look forward to the day of your ultimate triumph in our world. Until that day, we pray that your Kingdom may be reflected in our ministry, our family and our life. Through infant Jesus, we pray. Amen. 21He who has my commandments and keeps them, he it is who loves me; and he who loves me will be loved by my Father, and I will love him and manifest myself to him." 22 Judas (not Iscariot) said to him, "Lord, how is it that you will manifest yourself to us, and not to the world?" 23 Jesus answered him, "If a man loves me, he will keep my word, and my Father will love him, and we will come to him and make our home with him. 24 He who does not love me does not keep my words; and the word which you hear is not mine but the Father's who sent me. 25 "These things I have spoken to you, while I am still with you. 26 But the Counselor, the Holy Spirit, whom the Father will send in my name, he will teach you all things, and bring to your remembrance all that I have said to you. Loving Infant Jesus, in love you created us and you drew us to yourself. May we never lose sight of you nor forget your steadfast love and faithfulness. And may we daily dwell upon your word and give you praise in the sanctuary of our heart, you who are our all.